Imagine Sting, Lady Gaga, Bruno Mars, George Clooney, Tom Brady, Jerry Seinfeld and many other celebrities sharing the same stage for 7 live concerts EVERY year just to put on a show for a charity… Well, this is what “Les Enfoirés” do. Of course, it’s not Sting or Clooney but it’s our biggest (old and new) French stars and it’s a huge event in France. About 40 or so artists/singers/actors get together and sing a collection of new and classic French songs with some English pop songs thrown in. The key rule is that even if the artist is present on stage, he/she will NEVER sing their own songs. Most songs are interpreted by 4 people taking turns or singing harmonies and some numbers are sung by all 40 artists present. There are choreographies, costumes, elaborate scenes all interspersed with little comic interludes (while the stage gets reset and the artists change into their costumes). The seven concerts take place in a different city in France every year around the end of January. The first few shows are actually live rehearsals in front of an audience then the last 3 shows are filmed and a CD/DVD of the show is made. During the TV event (on March 11th in 2016), the artists push the sale of the DVD and CD that can be found everywhere in France the next morning. The 3-hour show gathers a huge TV audience, in 2013, more than 12.7 Million watched the TV event which represents a 53% audience share! DVDs and CDs of the show sell for ~ €18 a piece which goes entirely back to the charity and pays for ~18 full meals. The concert is a lot of fun both the audience but also for the performers. All these 40 artists don’t necessarily have time to learn all the choreographies and stage directions so there can sometimes be some fun moments… It’s obvious that these artists are having a lot of fun and some of them have been there for 15-20 years. Every year, a few ‘new’ faces are added and it’s actually considered an honor to be picked to participate in the show (most of these artists also donate lots of their time to the charity during the rest of the year). To the non-French person who has not had a chance to grow up with all these artists and songs, it can also sound really cheesy. Not only because some of these songs date back from the 80s and should most likely be filed in the “youthful mistake” drawer but also because some of these performers are not professional singers but actors, comedians and sports personalities… If you have perfect pitch, then some songs might make you cringe. It can be an acquired taste indeed but trust me, for the people who know all these songs, it’s one of the most fun 3 hours you will ever have! 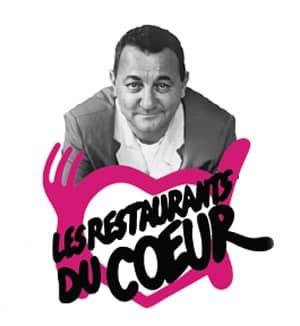 The charity for which “Les Enfoirés” perform is called “Les Restaurants Du Coeur” (“the restaurants of the heart”) often shortened to “Les Restos du Coeur”. This charity has been around since 1985 and was the brainchild of one of France’s most famous comedians: Coluche. The charity initially started to provide meals and groceries for the less fortunate but has now evolved into a 66000 people association providing not only meals but job training, housing, micro-loans and many other helpful services. Unfortunately, Coluche died in a motorbike crash the year after the creation of the charity and never got a chance to see how influential and how helpful it has become in nowadays France. The name given to the performers actually used to be an insult. The closest English translation would be ‘The Bastards’ or ‘The Tossers’ and apparently, it came to when the founder Coluche (known for his crass humor and language) called upon his artist friends to join him and called them by one of his favorite catchword, “enfoirés”. I’m sure that Coluche, wherever he is, is having a laugh seeing that! The Party is this Friday! Note, these links above are links to Amazon France. It’s almost impossible to find the DVDs or CDs on the US or UK stores but Amazon France will ship them internationally. We also get a tiny commission on these sales but the price remains the same for you.